Today I found out where the word meme comes from. In its early days, “meme”, which incidentally is often mispronounced as “me-me” or “meh-meh”, but in fact should be pronounced “meem”, primarily was only known and used by certain academics, but today this neologism is beginning to reach widespread use thanks to describing the viral spread of jokes, ideas, etc. via the internet. We need a name for the new replicator, a noun that conveys the idea of a unit of cultural transmission, or a unit of imitation. ‘Mimeme’ comes from a suitable Greek root, but I want a monosyllable that sounds a bit like ‘gene’. I hope my classicist friends will forgive me if I abbreviate mimeme to meme. If it is any consolation, it could alternatively be thought of as being related to ‘memory’, or to the French word même. It should be pronounced to rhyme with ‘cream’. The French word même that he references means “same” or “alike” (though the meaning changes somewhat depending on how it is used). The Greek word “mimeme” he derives “meme” from comes from the Ancient Greek μίμημα (mīmēma), meaning “that which is imitated” / “something imitated” / “something copied”. Memetics: which explores the transmission and evolution of cultural ideas in a scientific manner, though often somewhat unsuccessfully with the “scientific” part. 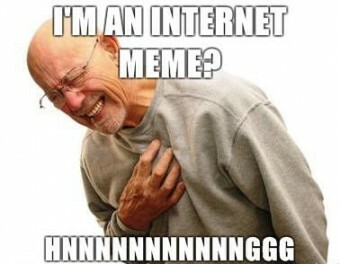 Meme Complex or memeplex: memes that have evolved into a symbiotic relationship with other memes. In terms of internet memes, this would be like the relationship between a meme such as “Herp/Derp” and various other meme elements that make up rage comics. In “real life” memes, this would be like the combined ideas that together form a certain religion. Memotype: the information-content of the meme. Memeoid: people who are so ingrained with some meme that they are willing to sacrifice themselves as a result of it, such as suicide bombers and the like. In a less extreme sense, it could be argued that every single person on the planet is a memeoid of one type or another. Memetic Marketing: the use of memes to virally market some product or business, often using internet memes. Mimema is also a genus of beetles of the family Monotomidae. In addition, there is a species of moth known as the Hyposmocoma mimema in the Cosmopterigidae family. One of the most popular internet memes of all time, the Demotivator meme, has its origins in a company called Successories. This company was started by Mac Anderson in 1985. Among their products were motivational posters with the now classic black background and text underneath a picture. Around 1998, along came Despair Inc., who started making spoofs of these motivational posters. In the beginning, these tended to be near exactly the same as their motivational counterparts which tended to feature some artsy photograph and were “office friendly”. The original demotivators would just change the text to be something depressing instead of uplifting. The demotivators from Despair Inc. were eventually popularized by the meme generating machine that is 4chan and spread from there. The first reference to the “Herp/Derp” Internet meme was in a work by yet another meme generating power-house, Trey Parker and Matt Stone. The particular work by them that popularized “Derp” was Baseketball. In the movie, at one point the two are caught sniffing a woman’s underwear and Matt Stone yells “Derp!” The two South Park creators have also used it several times in South Park, first appearing in the April 21, 1999 “The Succubus” episode. Memes have been compared to viruses in terms of how they can spread throughout a population, then sometimes go dormant for a time, only to spring up again by eliciting some behavior from its host. German biologist Richard Semon in 1904 suggested a word to mean not only similar to Dawkins’ idea of a meme, but the actual spelling of the word itself was nearly the same. In his case, he called it a Mneme. I always assumed it was a corruption of the name of the Greek titaness Mnemosyne (http://en.wikipedia.org/wiki/Mnemosyne), who was “the personification of memory in Greek mythology” (and origin of the work mnemonic). Meme comes from the Greek as you say and similarly paralleled by the French. There are other parallels from the Americans and the Chinese. The Brits, as usual including Dawkins, are the lying phonies about this as they historically are about everything. Dawkins once again proves that his primordial lack of intelligence is roundly reciprocal to the size of his overinflated buttocks. He and his simpleton pseudoscience is to be dismissed, at once. Mimeme is pronounced is not pronounced meemeem. In fact, Dawkins admits to ripping out the portion that sounded like gene, which is not the first part. ” rhyme with ‘cream’ “, i don’t think it’s (creah-meh), it is more (creah-m). Seems pretty obvious that Dawkins as good as plagiarised the term. In other words he almost certainly stole the idea from the earlier scientist and claimed credit for it himself. Dishonest, petty and pretentious. I loved the derivation and sourcing – and the critique.